Frye Gaillard of Mobile is one of Alabama’s most important and prolific writers. The author of a shelf of books, he has written about religion, politics, music and recently the civil rights movement in Alabama. “A Hard Rain” is, without a doubt, his biggest, most ambitious and finest work to date. Gaillard’s prose has, in the past, sometimes been just serviceable. In this book, it flows, hot, at times so passionate it reaches the level of poetry. He has brought to bear a lifetime of observing, listening, interviewing, researching and has brought his expertise in many areas to bear on this big—550 page–study of the 1960s. 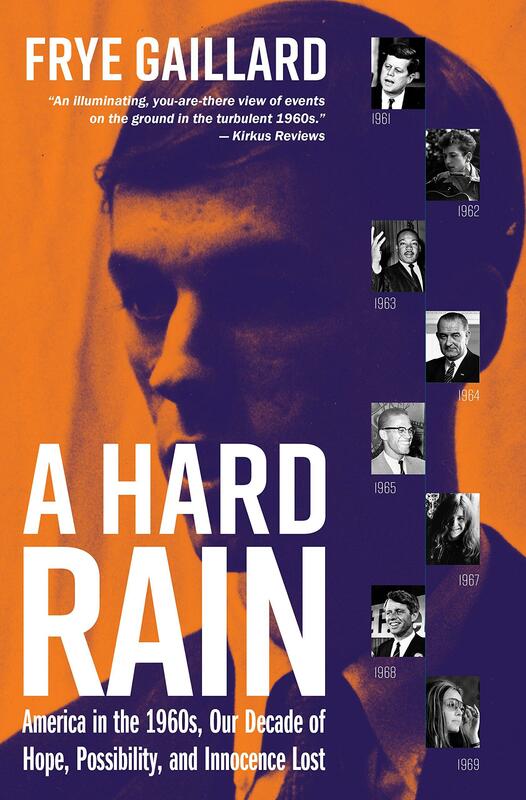 “A Hard Rain” is an accurate account of what happened, year by year, in many areas—politics, film, music, religion, race, the feminist movement, and so on. But, Gaillard also means to “offer a sense of how it FELT.” The book is, then, a kind of mixed genre, nine parts historical narrative and one part memoir. The memoir sequences are powerfully moving and I wish there were more of them. He remembers, as many of us do, what it felt like to hear Elvis, Joan Baez, Peter, Paul & Mary, or Bob Dylan, for the first time. It was NEW. No one had ever heard anything like that before. Or to watch “The Graduate” or “Dr. Zhivago.” One left these movies thinking, and then, often, talking with friends for hours. Those were emotional experiences one could have had anywhere. Also, only a relatively few people were present at the riots in Watts, or Newark, the assassinations of John F. Kennedy or Malcolm X. or Martin Luther King, Jr. or, most dispiriting of all, Robert Kennedy, Gaillard’s personal hero, but we all, no matter where we were, experienced these events nearly simultaneously, almost in real time, on television. Frye graduated from high school in 1964. I was class of 1959. Allowing for these five years, we and millions of other Americans went through this together. During the 60’s, he was in Mobile and Nashville, at Vanderbilt. I was in Hastings on Hudson and Albany, New York. Because he was a Southerner, some events struck him more powerfully—like the Greensboro sit-ins, the Freedom Rides through the South, the murders in Mississippi, and violence in Selma and Birmingham. Because, as he tells us, this was his home place, those were his people on the evening news. For the rest of America, civil rights violence took place in a faraway land, mysterious and frightening. But no matter where you were, the arc of the sixties was the same. We began in hope and optimism. The Kennedy inaugural, however globally ambitious and perhaps over-reaching it may seem now, was a call to patriotism, to virtuous action. Idealistic young Americans flocked to the Peace Corps. As the decade went by, however, and it became clearer that integration would be ferociously resisted, by Wallace and by the citizens of Boston, resisting busing, that poverty in America was exponentially more horrible than anyone had imagined, and that the war in Vietnam was illegal, immoral and, despite 58,000 American deaths and millions of Asians’ deaths, unwinnable, and our government was lying to us daily, innocence, our national innocence was lost and replaced in varying degrees by varieties of dropping out, cynicism, despair, selfishness. If you were alive in America in the sixties, you can’t forget it, no matter how hard you try.